About 3 years ago, when I was 23, my life turned upside down. It was Christmas time and I had come home to Minnesota from Detroit, Michigan, where I had been serving on my Gap Year after finishing university. To my shock, I came home to a broken family. My parents' marriage, of 30 years, was falling apart, and before I knew it, my dad had moved out. "How could this happen to me?" I thought. My family was a good Christian family. It was very easy to think "why me?" It was a dark time. I was in a lot of pain. I felt betrayed and lied to. I felt like my security blanket was ripped out from under me. Sadly, I fell into self-pity. More tragic than that was its result-beginning to doubt the Goodness of God. Fast forward 2 years, after an official divorce, many tears, and lots of prayer and some healing later, I was beginning to finally experience a bit more peace, joy, and security in my life. 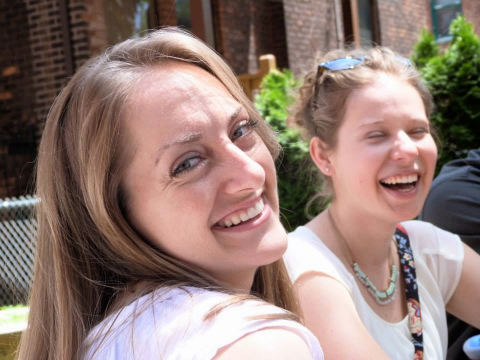 I had decided to stay in Detroit after my Gap Year, had made it my home, and was experiencing a real sense of family and belonging within my Christian community, as well as within my ministry working with young people. I loved my life there. It was full! Another most unexpected thing happened around this time. Over Christmas, I went on holiday to Belfast, Northern Ireland to see some friends. While I was there for 2 weeks, I met John. John grew up in the community in Belfast, called Charis, and was just finishing his Masters in Fine Arts in Belfast. He didn't waste any time to get to know me, and before the end of my trip, we had discerned through lots of prayer and discussion with wise people in our lives that we should continue letting the relationship develop. It was such a surprising gift! Through loads of conversations via Skype, John making a trip to Detroit to see me, and continued guidance from our pastoral leaders, we decided that we wanted to be in the same city by the following August. Of course, I thought, John would just come to Detroit and we would live happily ever after! That's not quite how it panned out, though. It became increasingly clear that it wasn't going to work for John to come to the States (visa, job, etc.) I started freaking out. I loved Detroit. I loved my life there-my friends and family. I had even just been offered full time work in my ministry (with benefits!!). Life was looking good for me in Detroit. I knew that God was calling me to let go, however, and follow Him wherever He might call-even to leave my "home" and country and see what God might have for me in Belfast. I also knew I would regret not pursuing things with John if I let fear hold me back. God called and I needed to respond. God made it pretty clear that I was supposed to be in Belfast. In a matter of a month, God provided a visa, a job volunteering for another youth organization, self-raised funding, a family to live with, and so much more. I could clearly see that this was God's will and so I decided to go...kicking and screaming...having a big old pity party all by myself and questioning God's intentions in His plan, "why would He make me let go of my home in Detroit after already losing my sense of home with my family?" I arrived in Belfast and I had everything I needed- a place in John's family and the wider Christian circle, a rewarding job, wonderful new sisters who were reaching out to me, and an amazing boyfriend who did anything and everything to show his support and care in this time of transition for me. But it wasn't MY Detroit family. It wasn't MY job in Detroit. These sisters weren't MY sisters from Detroit. I compared everything to what I had given up. Instead of accepting these amazing gifts, I rejected them because they weren't what I was used to and what I wanted. I fell deeper and deeper into self-pity. I focused so much on all that I gave up and all that I was missing that I couldn't see what God had placed right in front of my eyes. This self-pity isolated me. It began to hurt my relationship with John and others. It planted doubt in my heart that God had the best plan for me, and it did exactly what its name is- it focused my energy and thoughts on mySELF and not on others. My life was not like I had planned it. My family was in shreds and I was in a strange land. How did this happen? I had this silly notion in my head that since I was following God, I should get some kind of reward or something. Right?! Instead, I just felt duped. One night, when I was over at John's family's house, I had a conversation with John’s dad. He shared with me how he believed that God wanted to give me security here in Belfast. God, in His amazing Goodness, wanted to give me a new family, a new sense of place, a hope and a future here and that I just needed to embrace it. This deeply touched me and began to tear down my self-pitying attitude. I realized that the contentment and joy I had been seeking were here all along. I was just too blinded by my self-pity to see it. It hasn't happened overnight, but I'm slowly learning to trust that God, my loving Heavenly Father, truly knows what He's doing and that it is for my absolute best. I am also learning to own my decisions and not blame God for their outcome. My family isn't the way it used to be. That's okay. God wants to provide that in a different way for me now. I can choose to embrace it or reject it. I don't live in Detroit anymore. That's okay. God has given me a new home and a new place of belonging. I can choose to embrace it or reject it. I am not a victim. I can choose. Since then, John and I have decided to get married. (Wahooooo!) We don't know where exactly we'll be living in the future, but I may never end up in Detroit again. That's okay. I may not see my family and friends in the States for months or years at a time. That's okay. At times, I may feel a wee bit out of place and a stranger in a strange land living here. That’s okay. Can life be really overwhelming and hard at times? Yes. And that's okay-because God knows what He's doing. Life is still good because God is infinitely good. Stop comparing yourself to other women or with the idea of what you wish your life would look like - pray for contentment and joy! Spend time with your Maker in silence and in worship - soak in His Sovereignty and Goodness- let Him love you! Lord Jesus, root out all self-pity from within us. Replace it with the confidence and belief in your amazing and lavish love for us. You are a Good Father and you know exactly what You're doing at all times-for our good and for Your Glory. Jesus, may your perfect Will be done. We trust in you. Anna Bode grew up in lovely Saint Paul, Minnesota with her mom, dad, 2 brothers, and a lovely golden retriever. She attended the University of Minnesota, where she studied Community Youth Work. There, she also became involved in Saint Paul's Outreach, which helped her faith in Jesus come alive and planted a desire in her to be on mission within the context of the Sword of the Spirit Communities. After a summer in Detroit Summer Outreach, she eventually moved to Detroit for a Gap Year in 2011, where she lived for the following 3 years. There she worked for YouthWorks-Detroit and also taught and tutored part time. This past August, she moved to Belfast, where she now works for Youth Initiatives in their 11-14 year old program, "NUTS," is heavily involved in Charis, and is planning a Belfast wedding for August. She also has an affinity for Flamin' Hot Cheetos, chocolate, and a strong cup of coffee.